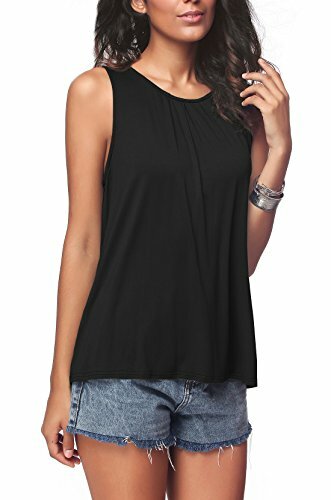 iGENJUN Women's Summer Sleeveless Pleated Back Closure Casual Tank Tops,Black,XL | What Should I Say? SIZE S------Bust 92 cm/ 36.2 " -----Shoulder 25 cm/ 9.8 " -----Length 59 cm/ 23.2 "
SIZE M------Bust 96 cm/ 37.8 " -----Shoulder 26 cm/ 10.2 " -----Length 61 cm/ 24.0 "
SIZE L------Bust 98 cm/ 38.6 " -----Shoulder 27 cm/ 10.6 " -----Length 63 cm/ 24.8 "
SIZE XL-----Bust 100 cm/ 39.4 " -----Shoulder 28 cm/ 11.0 " -----Length 65 cm/ 25.6 "
SIZE XXL-----Bust 104 cm/ 40.9 " -----Shoulder 29 cm/ 11.4 " -----Length 67 cm/ 26.4 "
This Size Information Is Just For Reference Only,And Please Allow 1-2cm (0.4-0.8") Differences Due To Manual Measurement. If you have any questions about this product by iGENJUN, contact us by completing and submitting the form below. If you are looking for a specif part number, please include it with your message.